For those who do not know the name or the history of this woman, you may know her as the Samaritan women at the well. I’ve been thinking about her ever since last Sunday, her feast day. The more I think about her I cry. I cry for her and countless others out in the world, living in the world as discards. And then I cry for me. About how little I know of the people who have gone before, passed the torch, handed my religion to me. There isn’t that much to know about Photini’s past. She was like everyone else, living a life of sin. People like to call what they are doing anything but sin. But the truth about sin is it’s very real and very every day, to the point that we become comfortable with it and it becomes the norm. Here she was minding her own business getting water from Jacob’s well just like countless others have done before her. Her ancestor Jacob had given the well to Joseph and his family. The Samaritans were half-breeds; half Jew and half something else. I relate to this because I’m pretty much a Heinz 57. Half anything you name it. The Samaritans were despised by the Jews and quite literally hated and treated like second class citizens. The Samaritans and Jews alike had grown accustomed to and lived out certain types of habits. I know exactly what she must have felt. For growing up in the early 60’s I have experienced racial hatred in many ways. You may also understand where she is coming from. She was a WOMAN. I don’t think I need to say that women throughout history were treated again and again like second class citizens. I definitely understand and relateto that being born a woman. And for most of my life I wished I was born a man. Ok, the gal had two strikes against her; she was a half breed and a woman. Anybody relate? Ok so the society she lived in already hated her. Who knows what kind of family life she was taught. There were no religious teachings to be over heard by listening to her brother who got to go school, because there wasn’t a school to learn anything because you’re a Samaritan. What information you got was passed on by a Jew who maybe had pity on you and told you or yelled it at you when you did something sociably wrong. And what information about religion or the way things should be done is treasured passed down without anyone correcting you and done blindly. Not knowing if you’re doing it right…but trying just the same. Here she was living out her life and failing miserably at that. No one really knows why or what happened to her; maybe abuse or just plain selfishness, but according to Jesus she had five failed marriages and was living with her new lover and didn’t even bother to be married. But for the Samaritan woman with questionable family life and relational problems this lifestyle was her norm. I hope by now you, like me, can kind of relate to this woman. I see the very same thing happening in my family. Nevertheless this was her life. What was she thinking walking up to a well just to get water like she did so many times before? Living her life… best way she knew how… living in an unfair society. Not knowing not how to make sense of it or if she should even care. Then there sat Jesus. He knew her heart… he knew that if given a chance, a spark would grow into cleansing fire… But yet the conversation was about water. Little did she know that her new life in Christ would start at one well and later through being martyred would end in another. Please read the scripture below and the historical story of my new friend Photini. She is one of many who speak of our rich beautiful past. Knowing this I hope it makes your heart strong and gives you courage to be a true Christian in this century. John 4. Now when Jesus learned that the Pharisees had heard that Jesus was making and baptizing more disciples than John (although Jesus himself was not baptizing, just his disciples), he left Judea and returned to Galilee. The Samaritan Woman.He had to pass through Samaria.So he came to a town of Samaria called Sychar, near the plot of land that Jacob had given to his son Joseph. Jacob’s well was there. Jesus, tired from his journey, sat down there at the well. It was about noon. 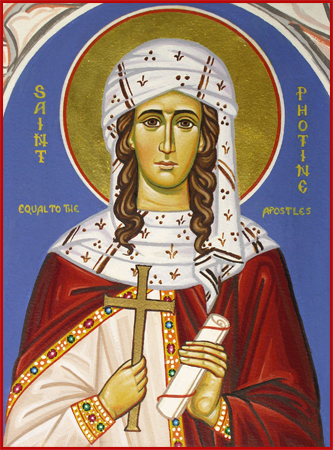 St. Photini lived in first century Palestine. 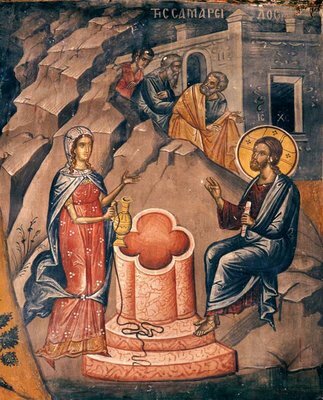 She was the Samaritan woman who Christ visited at the well asking her for water. 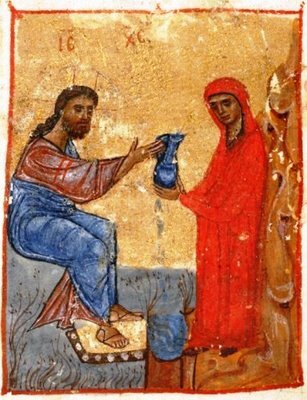 It was she who accepted the “living water” offered her by Christ Himself after repenting from her many sins (John. 4:5-42). She went and told her townspeople that she had met the Christ. For this, she is sometimes recognized as the first to proclaim the Gospel of Christ. She converted her five sisters (Sts. Anatole, Photo, Photis, Paraskeve, and Kyriake) and her two sons (Victor and Joses). They all became tireless evangelists for Christ. The apostles of Christ baptized her and gave her the name of Photini which means “the enlightened one.” She is remembered by the Church as a Holy Martyr and Equal to the Apostles. After Sts. Peter and Paul were martyred, St. Photini and her family left their homeland of Sychar, in Samaria, to travel to Carthage to proclaim the Gospel of Christ there. During the reign of Emperor Nero in the first century, excessive cruelty was displayed against the Christians; St. Photini lived in Carthage with her younger son, Joses. Her eldest son, Victor, fought bravely in the Roman army against the barbarians, and was appointed military commander in the city of Attalia (Asia Minor). Later, Nero called him to Italy to arrest and punish Christians. Then Sebastian suddenly felt a sharp pain in his eyes. He was dumbfounded, and his face was somber. For three days Sebastian lay there blind, without uttering a word. On the fourth day he declared, “The God of the Christians is the only true God.” St. Victor asked why Sebastian had suddenly changed his mind. Sebastian replied, “Because Christ is calling me.” Soon he was baptized, and immediately regained his sight. St. Sebastian’s servants, after witnessing the miracle, were also baptized. Reports of this reached Nero, and he commanded that the Christians be brought to him at Rome. The Lord Himself appeared to the confessors and said, “Fear not, for I am with you. Nero, and all who serve him, will be vanquished.” The Lord said to Victor, “From this day forward, your name will be Photinus, because through you, many will be enlightened and will believe in Me.” The Lord then told the Christians to strengthen and encourage Sebastian to persevere until the end. All these things, and even future events, were revealed to St. Photini. She left Carthage in the company of several Christians and joined the confessors in Rome. At Rome, Emperor Nero ordered the saints to be brought before him, and he asked them whether they truly believed in Christ. All the confessors refused to renounce the Savior. The emperor then gave orders to smash the martyrs’ finger joints. During the torture, the confessors felt no pain, and their hands remained unharmed. Nero ordered that Sts. Sebastian, Photinus and Joses be blinded and locked up in prison, and St. Photini and her five sisters, Anatola, Phota, Photis, Paraskeva and Kyriake, were sent to the imperial court under the supervision of Nero’s daughter, Domnina. St. Photini converted both Domnina and her servants to Christ. She also converted a sorcerer, who had brought her poisoned food that was meant to kill her. Three years passed, and Nero sent to the prison for one of his servants, who had been locked up. The messengers reported to him that Sts. Sebastian, Photinus and Joses, who had been blinded, had completely recovered, and that people were visiting them to hear their preaching. Indeed, the whole prison had been transformed into a bright and fragrant place where God was glorified. Nero then gave orders to crucify the saints, and to beat their naked bodies with straps. On the fourth day, the emperor sent servants to see whether the martyrs were still alive. Approaching the place of the tortures, the servants fell blind. An angel of the Lord freed the martyrs from their crosses and healed them. The saints took pity on the blinded servants, and restored their sight by their prayers to the Lord. Those who were healed came to believe in Christ and were soon baptized. In a rage, Nero gave orders to flay the skin from St. Photini and to throw her down a well. Sebastian, Photinus and Joses had their legs cut off, and they were thrown to dogs, and then had their skin flayed off. The sisters of St. Photini also suffered terrible torments. Nero gave orders to cut off their breasts and to flay their skin. An expert in cruelty, the emperor readied the fiercest execution for St. Photis: they tied her by the feet to the tops of two bent-over trees. When the ropes were cut, the trees sprang upright and tore the martyr apart. The emperor ordered the others beheaded. St. Photini was removed from the well and locked up in prison for twenty days. Hearing such words, Nero gave orders to throw St. Photini down a well, where she surrendered her soul to God in the year 66. How great is the voice of the martyrs. Can you hear her?